The president’s comments came during a meeting Tuesday with NATO Secretary General Jens Stoltenberg who is in the U.S. capital marking the 70th anniversary of the alliance. President Trump acknowledged that the U.S. and its allies have made “strides” to resolve the conflict in Afghanistan, considered America’s longest war. The Trump administration has intensified efforts to achieve peace with the Taliban in recent months. In August 2017, the administration made the negotiated political reconciliation between the Afghan government and the Taliban the primary tenet of its strategy to end the conflict. Since the war began in October 2001, the United States has spent nearly $1 trillion and lost 2,280 American service-members, mainly to attacks at the hands of the Taliban. U.S. troops have also suffered nearly 20,440 injuries in the ongoing conflict. In the first speech by a NATO chief to a joint session of the U.S. Congress, Stoltenberg told American lawmakers on Wednesday that the alliance supports the Trump administration’s efforts to find a peaceful solution to the crisis. He stressed that NATO does not intend to say in Afghanistan “forever,” adding that when the time comes, the alliance and the United States will leave together. The Taliban’s reluctance to allow Kabul to participate in the ongoing peace negotiations despite U.S. insistence that the process is owned and led by the Afghan government has surfaced as the main point of contention among negotiators. Taliban narco-jihadis claim the will only negotiate with the Afghan government, which they consider to be an American “puppet,” when foreign forces leave the war-ravaged country. On Tuesday, Afghan President Ashraf Ghani declared that Kabul has conditions for peace, adding that Afghans will set the limits for talks, TOLO News reports. “The peace talks are without conditions but peace has conditions and the Afghan nation will set the limits for the talks. It will not be acceptable for us if there is pressure on us to act illegally,” Ghani said. Peace negotiations yielded two draft agreements last month — the eventual withdrawal of American troops and assurances by the Taliban that Afghanistan will not serve as a sanctuary for terrorists seeking to attack the United States. Trump’s Pentagon has reportedly offered to pull American troops out of Afghanistan within three to five years, but Taliban terrorists insist foreign troops must leave in months. The Taliban wants American troops out, but they want to keep the flow of U.S. taxpayer funds coming into Afghanistan. 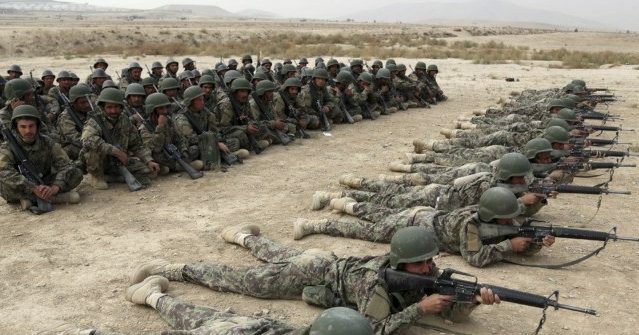 Taliban terrorists have rejected the Trump administration’s proposal to leave behind a residual counterterrorism American force so ensure the jihadis keep their promises under a potential peace pact. Last week, the U.S. Special Inspector General for Afghanistan Reconstruction (SIGAR), a watchdog agency, revealed that a peace deal would “likely” fail to resolve the South Asian country’s terrorism problem and opium crisis. With or without a peace settlement, Afghanistan will likely continue to grapple with multiple violent-extremist organizations, who threaten Afghanistan and the international community …With or without a peace agreement, Afghanistan runs the risk of becoming a ‘narco-state’ and has already been described as such by former officials from the U.S. government and international organizations. The watchdog agency found that security conditions will continue to deteriorate in Afghanistan if the United States fails to deal with the country’s cultivation and trafficking of opium, the primary ingredient in heroin. A small amount of Afghan heroin has made its way onto American streets amid an unprecedented deadly opioid crisis that has killed tens of thousands in the United States in recent years. Taliban jihadis generate the majority of their funds from the lucrative opium industry. Without U.S. and opium funding, Afghanistan would collapse, SIGAR suggested. Refusing to agree to a truce with the Afghan government, Taliban narco-jihadis have intensified attacks amid the peace negotiations. Ghani said the U.S.-backed Afghan security forces will continue to defend their country. Ghani warned that the security forces will defend the country as long as peace talks reach a result. “We cannot surrender to anyone and as long as the peace talks do not reach a result, we will defend our soil with dignity,” the Afghan president reportedly declared. American lawmakers from both parties have repeatedly called for an end to the U.S. war in Afghanistan.